Flatwork should be done after brick or siding is installed to minimize chances for damage to the surface. Flatwork should be done after all underground water, sewer, gas, and electrical lines have been dug, placed, and passed inspection. It should also be done before you begin to rough grade your lot for landscaping. 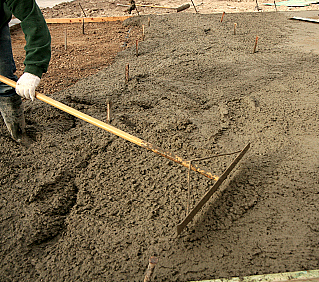 Flatwork may be done by the same contractor who did your foundation, or any contractor who pours and finishes concrete. Unlike concrete floors, flatwork does not need a vapor barrier underneath. Your local building code probably does not require (your flatwork contractor will know for sure) a crushed-stone base. I usually pour the concrete for my driveways, sidewalks, and patois directly onto the ground. That ground should be packed smooth, free of rocks and dirt clumps. Stone may be helpful as fill, however, depending on the slope you’re working with. No one can guarantee concrete to never crack. Expansion joints help to prevent cracks and should be placed in a concrete driveway approximately every fifteen feet and every four feet in sidewalks. Wire mesh can also help prevent cracking, but with enough expansion joints you probably won’t need it. The expansion joints are particularly important on sloped ground, which makes cracking more likely. Before the concrete is completely hardened, a broom is pushed lightly over the surface, creating a texture that prevents a slippery walking surface.